Throughout 2019 and into 2020, Charlotte Street Foundation will be transitioning from its nomadic presence throughout Kansas City and relocating to a new, permanent location at 3333 Wyoming Street in the heart of the Roanoke industrial corridor—nestled between 39th Street and our longtime home in the Westside neighborhood. Charlotte Street’s new facility will co-locate Charlotte Street’s longest-standing programs into one newly renovated campus, incorporating the Studio Residency, exhibition and performance venues, offices, and more. 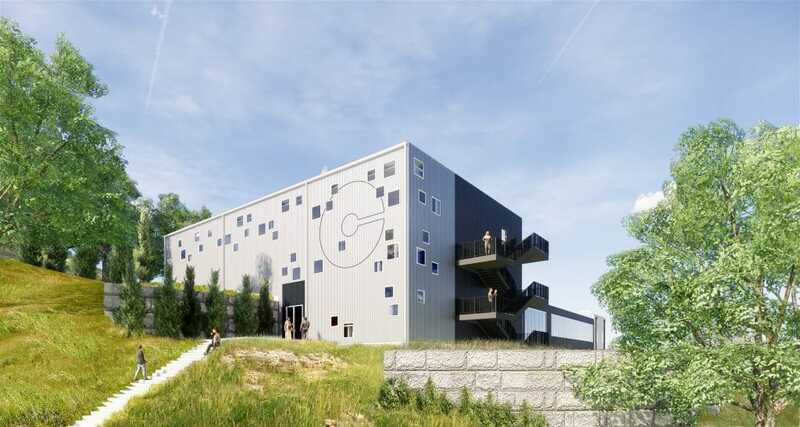 Conceptual exterior rendering of Charlotte Street Foundation’s new campus in the Roanoke industrial corridor. Image provided by Hufft. We’re happy to share some exciting news from the Charlotte Street Foundation! After twenty years of nomadic work with Kansas City’s Art community, Charlotte Street is poised to realize a vision for a multi-use facility that will be a permanent site housing Charlotte Street’s Studio Residency, exhibition space, flexible black box performance space, office, and new resources like a shared workshop, library/archive, and collaboration/gathering spaces. This project is critical to our commitment to strengthening Kansas City’s community of artists, who will see many benefits including cross-disciplinary exchange, audience development, and investments in safer, more accessible, and better-equipped facilities. Charlotte Street will also be well positioned to host gatherings of arts professionals and visiting groups across our broad national and regional network, exposing local artists to new networks and opportunities. The decision was also made in consideration of long-term sustainability. The Urban Culture Project, which provided studio space and venues for Charlotte Street for over a decade, was very dependent on heavily subsidized rent from generous partners in the Downtown Core. Times have changed and those kinds of opportunities are less readily available, and are becoming increasingly short term and more expensive. The purchase of our own space allows for a permanent commitment and investment in facilities for artists, and opens up the possibility of new programming and opportunities that have been impossible to imagine in the widely dispersed and transitional spaces occupied to date. In the months to come, we will release additional information as the work to transform the site develops. We anticipate doors to open in early 2020, and will maintain programs in our temporary venues through 2019. Where are the Charlotte Street Foundation offices currently located? Charlotte Street Foundation’s offices are currently active in our soon-to-be-permanent location at 3333 Wyoming Street, Kansas City, MO, 64111. We anticipate that our offices will remain there throughout the renovation. Office hours are from 12:00 PM to 5:oo PM Tuesday through Friday. You can still contact us at 816.221.5115 or by emailing us at info@charlottestreet.org. How is Charlotte Street Foundation’s new campus being funded? Charlotte Street’s new headquarters and campus is possible through the support of a community of visionary philanthropists and donors who care about artists and the arts in Kansas City. Propelled by a $5 million challenge grant issued by an anonymous donor, Charlotte Street has launched a $10 million comprehensive capital campaign. Support from the campaign will be used to fund the purchase and renovation of the new headquarters at 3333 Wyoming, launch programming in the new space, and establish an endowment to ensure Charlotte Street’s long-term financial sustainability. How will programming be affected by the move? All of Charlotte Street Foundation’s current programming (Studio Residency, Open Call programs, Visual Artist and Generative Performing Artist Awards, Rocket Grants, Startup Residency, and Neighborhood Artists Residency) will be active throughout 2019 and into 2020 until our new home is ready for operation. Exact timelines for closure of the la Esquina and Capsule venues will depend on construction timelines and other factors. Other programming that Charlotte Street supports, such as Rocket Grant projects, would also continue to be dispersed through the region, and we will continue our relationships with partnering organizations like the Kemper Museum of Contemporary Art, Nerman Museum of Contemporary Art, and H&R Block Artspace to host the annual Visual Award Exhibitions and other such collaborations. And of course, we will continue to develop and support site-specific projects, pop-ups, and location-based programs like the Neighborhood Artists Residency and the Startup Residency. When will design details of Charlotte Street’s new campus be released? Design renderings and details will be released in late spring of 2019. When will construction begin for the new campus? Construction is currently set to begin in the summer of 2019 and will conclude in early 2020.
Who is overseeing construction of the new campus? Charlotte Street hosted competitive processes in fall 2018 to select architect and contractor to design and build the new campus. Hufft was selected to lead architectural design, and Newkirk Novak Construction Partners were selected to manage construction. What can we expect from the new Charlotte Street Foundation? Charlotte Street Foundation will include spaces for artists to collaborate, exhibit, rehearse, perform, and gather with the public. It will also support a broad range of media, including printmaking, video and audio production, sculpture, and work that incorporates nature. Our Studio Residents will be housed in a versatile, retreat-like space. The entire headquarters will have a campus-like feel, with distinct spaces dedicated to different purposes and flexibility to grow and change along with our city. This high-profile project will give Charlotte Street Foundation more stability and prominence in Kansas City, and put us on sustainable financial footing indefinitely. Ultimately, this stability enables us to support collaboration, risk-taking, and excellence in Kansas City’s artist community while building new audiences and enriching our city’s attractiveness and national reputation.